I decided to upgrade the hard drive on my PS3. My 160gb slim model was causing me to have to shuffle between downloading and deleting games I wasn’t playing, and I wanted to have them all available. Especially going forward with retail games being available digitally (I bought Dishonored digitally) and all the games PS Plus releases, more hard drive space is a must. It may not be common knowledge either but to download and install a game you need double the available hard drive space that the game requires. This procedure is how you perform the upgrade for all the slim models. Once you decide to upgrade, the drive is up to you. I had a long weekend from school and thought it would be the perfect time to upgrade. Most 2.5” laptop drives will work. I opted for a Seagate Momentus 1TB 5400rpm 8mb cache. You could also go with a faster hard drive speed, I’ve read that it doesn’t make too much difference in the heat output, or more cache memory but, for me, the extra space was more important than a slight upgrade in performance. This is a pretty economical way to go as the drive was around $100 at Best Buy. If you buy from Amazon or NewEgg, you could probably save some money, but I opted for the convenience of buying it when I found I had the time to install it. For this job you will need a small Phillips head screwdriver. I have a lot of tools and used a Snap On number 0 electronic screwdriver (made for electronics work, not electric itself). You can probably find one that would work out of an eyeglass repair kit as well. Begin by backing up your system. This is the time-consuming part of the process. The most important things are syncing your trophy data with the server and uploading whatever saves you can into the cloud. If you do not have PS Plus and a gig of cloud storage a USB drive will work for most saves. It will be a long process though if you are like me and have 5 years of save data. You’ll also need to back up any songs or pictures you have installed. Things like game install data, the games themselves, downloaded movies, music, apps, or themes can all be downloaded again and there is no need to backup. Once you take the old hard drive out, if you try to put it back in it will format it, so make sure you have everything you need. I should also mention that any PSOne or PS2 saves you have on your system (if, like me, you migrated from an older model that could play those games and still have the saves or you have created them for downloadable PSOne or 2 games) would also need to be backed up to your drive. You cannot save these to the cloud. Next, turn off and unplug the PS3 setting it on a table where you have some good light. You will be looking for a small access panel just under disc drive on the front of the system on the bottom. If you have a small flat head or a thin knife or razor blade, you can pop the panel out. It is attached to the system and rotates to give you access to the screw holding the hard drive and front panel in place. After removing the screw (I used a magnet dish but if you don’t have one, keep your screws in a Dixie cup or bowl to keep from losing them) slide the panel underneath the disc drive out away from the system as pictured. Now you will see a tab for pulling the old hard drive out. There is nothing else holding it in, so give it a pull. 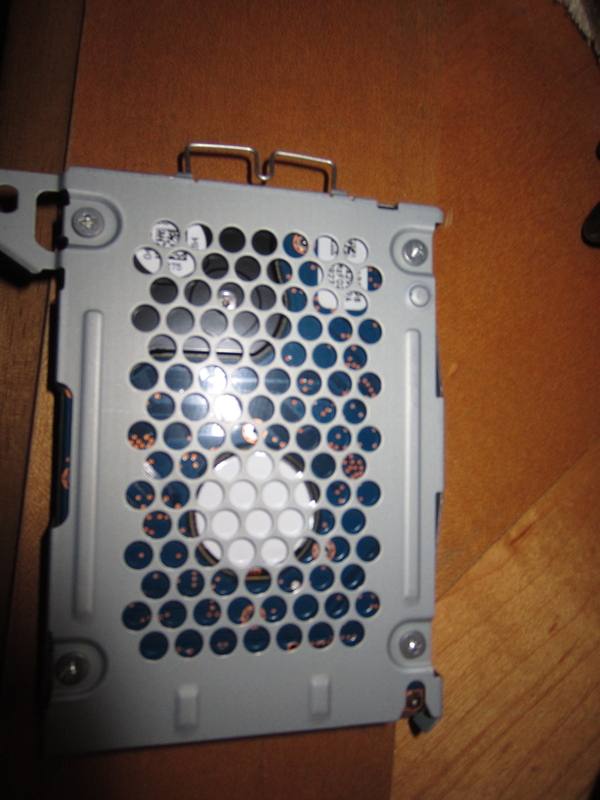 Once out, turn it over and there are four small screws holding the hard drive to the tray. Removing these allows you to pop the hard drive out of the tray. Replace with the new hard drive (it will only go one way), reinstall the four screws, and install it. Push the tab of the hard drive tray flat and reinstall the front panel. Once it is back in place you can install the first screw we removed and replace the panel. Now your new hard drive is installed and ready to go. At this point, if you have not done so already go to Playstation.com or the Playstation Network site and download the newest update data. The updates are usually in the bottom right corner of the screen and the PS3 will require these to be booted from a USB drive. This is important: Create a file on your USB drive labeled, specifically: “PS3”. Inside of that file create a file that says “Update”. This is where you must save the update data. The system will search for those files and if it does not see them it will tell you it cannot find the update data. Once you have the data on the drive, plug the PS3 back in, install the USB drive and turn it on. It will lead you through the setup (you’ll have to press start and select together once or twice). When setup is complete you can sign in to Playstation Network with your existing account and begin syncing your data, downloading saves from the cloud, and downloading games. I should mention there is a download list tab in the upper corner of the Playstation Store (before the redesign they are rolling out) where you can see your entire download history. Any additional DLC for a game, unlock keys, or unlocked characters will all need to be downloaded to have access to them. For me, the upgrade was flawless. I was playing an endurance race on Gran Turismo 5 and saved in the middle of it. Changed out the hard drive, reinstalled all the game data, DLC, and the like 8 gigs that game suggests and started it and it picked right back up with the save I had made in the middle of the race. I know it should have done that, but I had no confidence that it would not have lost my race progress. Downloading and installing games will be a chore, but you do not have to do them all at once, or let them run while you sleep or go to work/school. Hopefully, this article helped you if you decided to upgrade your hard drive. I would say the process is worth the trouble. Mechanically, if you can put a screwdriver on a screw and turn it, you have the skills to perform the upgrade. The actual upgrade will take you less than two minutes. Reinstalling all your data and games will take much, much longer but should be a labor of love.